A recent United Nations study identified traffic accidents as the third major cause of death in the world. The same holds true for Canada, however, Transport Canada reports some good news for Canadians, in that the number of deaths and serious injuries due to motor vehicle accidents has been on a downward trend for many years. Specifically, the number of road deaths has decreased to 2500 Canadians annually, from the more than 6000 who died each year in the mid 1970’s. A Canadian Public Health Assoc report attributes this reduction in fatalities largely to higher motor vehicle safety standards, improvements in highway engineering, changes in public attitudes regarding road safety, and improved trauma treatments. Seat belts and airbags are two technologies that protect passengers in the event of a collision, however, seat belts only work when we make it a point to wear them every time we drive. As drivers and passengers, we can certainly reduce the likelihood of being hurt by adopting other proactive behaviours such as maintaining our focus on the road and never driving while under the influence of drugs or alcohol. Although most vehicle collisions involve only other vehicles, almost 20 per cent of fatalities on Canadian roads are pedestrians and cyclists, who are all too often innocent victims of careless drivers. Recently, a cyclist was hit and injured on King Road in Burlington, but fortunately, the injuries suffered were not life-threatening, however, this is not always the case. Quite often injuries suffered from bicycle accidents are severe, and in some cases, fatal. One cannot overemphasize the importance of using the correct protective gear, such as helmets and lights (at night), when riding a bicycle or motorcycle as the odds of survival and minimum injury are exponentially increased, depending on the type of impact during the accident. As drivers, we need to take care when opening our car door in areas where bicycles drive, as ‘dooring’ incidents are on the rise, and also watching for cyclists at intersections. Everyone can play a part in preventing personal injury due to motor vehicle collisions, motorcycle accidents, boating accidents and accidents involving other recreational vehicles. Injuries, which include catastrophic injury, spinal cord injury, brain injury and wrongful death, may permanently alter the lives of all those affected. Every time we get into our vehicle, as a driver or passenger, we can benefit from contemplation of the possible negative outcomes that could result from poor driving practices such as distracted driving, and conversely, how much safer we (and those around us) are, when practicing defensive and focused driving techniques. A June 2015 head on collision in rural Flamborough, resulted in serious injuries to one of the car drivers. The 21 year old woman was trapped in her vehicle for some time, and had to be cut out by local firefighters. The driver and passenger in the other vehicle were fortunate to sustain only minor injuries, as was reported at the time of the accident. Police are asking witnesses to come forward, in the hopes of gaining input on how the accident occurred. All three victims were taken to hospital, where it is expected that they will receive a full assessment of injuries. A complete medical checkup is extremely important because although injuries may appear to be minor, there is sometimes more physical damage than is initially realized and injuries can sometimes worsen over time. When involved in a vehicle collision, it is very useful to gather as much information as possible immediately following the incident. If the severity of your injuries does not prevent you from doing so, you should record the events leading up to the accident, make a note of anyone who may have been on the scene, and record personal details of the driver, insurance information and vehicle licence. Some these details can be lost or forgotten over time, and some may be important in the success of your claim against a negligent party. Physical injury is a significant factor in many insurance claims, but property damage often accompanies physical injury when accidents occur. A severe thunderstorm in August 2015 affected the Millgrove Flamborough community. The storm itself was estimated to have lasted slightly less than a minute but that was enough time to cause serious structural damage to many homes. Uprooted trees and damaged roofs represented the majority of the damage. Fortunately, no injuries were reported. During a severe thunderstorm in Windsor the previous summer, another man was not so lucky. He was critically injured when a large tree fell on him, pinning him to the ground until he was freed by paramedics and firemen. This unfortunate event reminds us that staying indoors during a storm, particularly when lightning is involved, is the safest choice. In terms of liability, however, property owners need to take care to repair or remove structures that may become unstable and injure others during storms. Trees that are already dying and are sometimes hollow inside are much more likely to break or topple during high winds or a snow storm. For this reason, we should cut down any trees that we know to be dying or already dead. If someone is injured by a falling tree or another structure from your property, you may be liable. 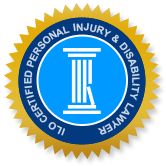 The personal injury lawyers at Injury Lawyers of Ontario (ILO), offer expertise in a wide variety of personal injury claims resulting from vehicle collisions, slips and falls, recreational accidents and other incidents that result in injury. The ILO has local offices throughout Ontario and our collective experience enables us to offer you the best legal advice specific to your case, during a time that is both challenging and stressful. Give us a call today or visit us online and allow us to represent your claim in the efficient and fervent manner that you deserve.